Praise becomes a sacrifice (costly) when we offer it to God in the midst of the contrary situations of life. It doesn’t really take much to praise God when things are fine or not too bad. But it is much harder to keep on praising God when our hopes are dashed and we are surrounded by troubles. Surely it is much easier at such times to blame rather than praise God. Yet learning to offer costly praise is crucial if we want to see God’s victory. In Hebrew 13: 15 the Bible says that what we are doing by such a sacrifice is confessing his name. What that means is that as we continue to praise God even when all seems hopeless, we are confessing all that God is, over our situation. We are confessing that he is love, even though it looks as if he has abandoned us. We are confessing that he is all-wise despite the confusion that faces us. We are confessing his almighty power, even though our situation may look impossible. 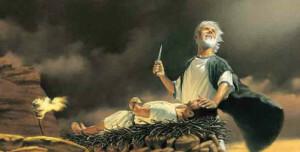 The bible says, “with such sacrifices God is pleased”(Heb.13: 16 – NIV), and it causes him to act mightily on our behalf. That was what happened to Paul and Silas. They had been shamefully beaten by the people they had gone to help, and when they found themselves faced with a night of hopelessness in prison, they CHOSE to offer a sacrifice of praise. Their minds may have rebelled against it, but they decided not to miss the opportunity to offer God a sacrifice. We know how this their sacrifice went up as a sweet smelling savour to God, and provoked him to come down and shake their prison. This kind of praise has very little to do with our emotions. God does not look at our feelings but rather at our willingness to praise him in spite of how we may be feeling. This kind of offering is one that comes from our heart and our will, but it must be expressed through our lips. Not only does it bring God’s intervention, but also the repeated offering of this kind of sacrifice builds character into us. So let’s not waste the opportunity that the troubles of life offer us. Let us offer unto God a sacrifice of praise!